The Shollie is a German Shepherd Border Collie mix. A dog that is aimed to combine the lively intelligence of the Border Collie with the devotion and loyalty of a German Shepherd. Is a Shollie the right dog for me? Fans of mixed breed dogs find the idea of a Shollie attractive, and for good reason. The best qualities of both breeds can combine to make one very intelligent and trainable canine companion. Is a Shepherd Collie mix the right dog for you? As with most cross breeds, there are pros and cons to owning a Shollie. 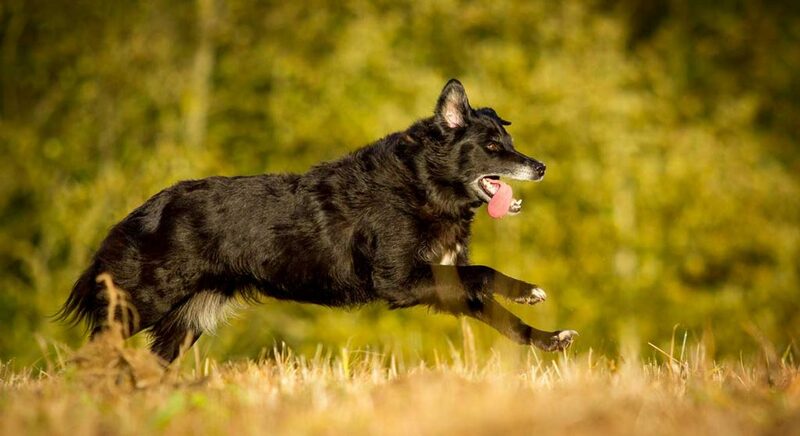 We’ll take a closer look at the Shollie, including health, temperament, and appearance, so you can decide if a Collie Shepherd cross is the perfect pet for you and your family. But first, let’s take a quick look at “designer” mixed breed dogs like Shollies, and how they differ from mutts and purebred dogs. What are Mixed Breed Dogs? The popularity of cross breeds like the Collie and Shepherd mix has been on the rise for the past few decades. The goal of designer mixed breeds is to combine the best qualities of two different purebred dogs. A dog is considered to be purebred if its parents are two pedigreed dogs of the same breed. A pedigree is a known ancestry. Purebred dogs are usually registered with official dog breed organizations like the American Kennel Club (AKC). A designer cross breed like the German Shepherd Border Collie mix is a planned mating between two purebred dogs from different breeds. Mutts are the offspring of a mating (often unplanned) of two dogs of unknown ancestry. Are mutts and mixed breed dogs healthier than purebred dogs? Many people assume that purebred dogs are inbred, and outcrossing leads to more robust health. There’s even a term for this: hybrid vigor. Cross breeding can lead to improved health. As a potential owner of a mixed breed Shollie, the most important thing you can do is find a responsible breeder who tests for genetic health conditions in their Border Collie and German Shepherd breeding stock. We’ll talk more about how to find healthy German Shepherd Collie mix puppies later, but first, an introduction to the Shollie! The Border Collie is a livestock herding dog, well known for its keen intelligence and high energy. Border Collies are hardworking by nature and require a job to do to keep them happy. Don’t have any sheep to herd? They also excel in canine activities like flyball and agility trials. Like the Border Collie, the German Shepherd also belongs to the herding dog group, and is a dedicated working dog. The breed is known for its courage, intelligence, and devotion to its family members. German Shepherds are often trained to be service animals and police/military dogs. The Shollie dog, being the result of a crossing of two of the smartest breeds, is generally a very intelligent and trainable family pet. Because the Shollie is the product of two working dog breeds, it shines in activities like agility and obedience training, and (of course!) herding. What will your adorable Collie Shepherd puppy look like when fully grown? Let’s find out! How Big Is A Shollie? The German Shepherd is a handsome dog that projects strength and confidence. Males are 24 to 26 inches tall at the shoulder and females are 22 to 24 inches tall. Males weigh between 65 and 90 pounds, and females are 50 to 70 pounds. Border Collies are considerably smaller than German Shepherds. Males stand between 19 and 22 inches tall at the shoulder; females are 18 to 21 inches tall. Their weight ranges between 30 to 55 pounds, with females being lighter than males. Shollies range anywhere between the two! From 19 to 26 inches, and 30 to 90 lbs! That’s quite a range! However, generally Shollies are described as falling on average over 21 inches high at the shoulder and weighing around 70 pounds. Most Shepherds have a medium length double coat. The coat can be of any color, although brown with black markings is the most famous coat coloring for the breed. Border Collies have a double coat that can be either long (called rough) or short (called smooth). While many people think that a Border Collie is always black and white, the coat can come in any color or combination of colors. Because it’s a cross breed, the Shollie can have any combination of the physical characteristics of either parent breed. Expect a soft, thick, medium length coat that will require regular grooming. You can also expect a good amount of shedding, especially during the warmer months. While you will often see pictures of Shollies with the traditional Shepherd coloring, they can be any color or combination of colors. Eye color is usually brown. 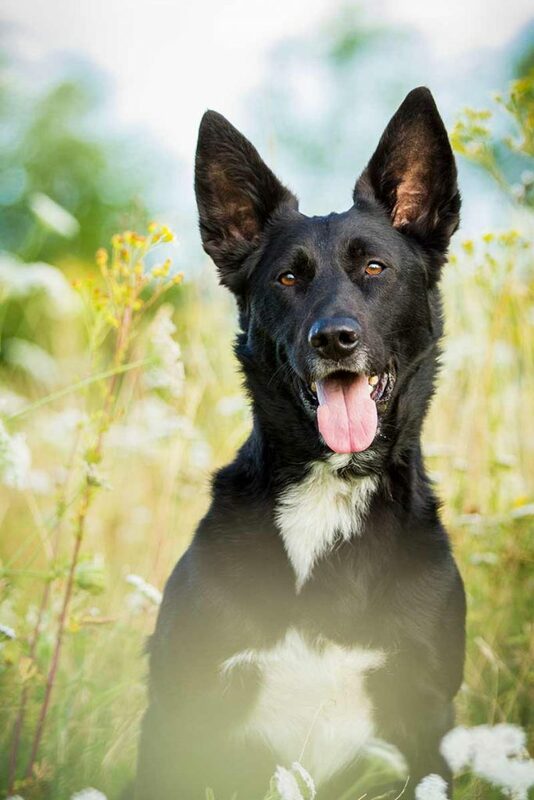 The parent breeds of the Border Collie Shepherd mix both have an alert, intelligent, and ready-to-work nature. Both are active and appreciate plenty of play and exercise, but for the Border Collie, daily activity is an absolute must. Your Shollie’s temperament will be a mixture of both parent breeds. Expect a dog that’s lively, active, and intelligent. Border Collie Shepherd mixes do not thrive when left alone all day in a small apartment. The ideal environment is a home with a large yard, or regular access to open space. Dogs with working dog ancestry like the Shollie require plenty of time and attention from their human companions. Stimulating, interactive games and play sessions are ideal for this clever and intelligent dog. Shollies generally do well in households with children and other pets. However, as with any medium to large sized dog, it’s always best to socialize them from an early age and supervise their interactions with other pets and small children. Like both parent breeds, the Shollie is highly trainable. They benefit hugely from positive reinforcement training. Shollie puppies are the star students of puppy kindergarten class. As adults they will appreciate the mental stimulation of learning new games and tricks. Lots of activity will keep your German Shepherd cross Border Collie happy and healthy. Speaking of health, what are the health issues your Shollie could inherit from its parent breeds? Most purebred dogs have some genetic health conditions common to the breed. The health of your puppy depends not just on proper care, but also on the genetic health of its parents. Here is an overview of the inherited health issues of both parent breeds and the Shollie mix. Experts report that the German Shepherd breed has over 50 hereditary diseases. Some are more common than others, of course, and careful breeding practices can eliminate inherited diseases in a genetic line. German Shepherds can inherit such conditions as pituitary dwarfism, degenerative myelopathy (a neurodegenerative disease), congenital idiopathic megaesophagus (dilation of the esophagus), and pancreatic acinar atrophy (an autoimmune disease). Like many other dog breeds, Shepherds can also be prone to bloat and hip and elbow dysplasia. There are genetic tests available for many inherited health conditions. Reputable breeders will health test their dogs and provide all relevant test results to their clients. Hip and elbow x-rays should be certified by the Orthopedic Foundation for Animals. Border Collies are also prone to hip dysplasia. Other genetic conditions seen in the Border Collie include an eye disease called Collie eye anomaly, deafness, epilepsy, a joint disease called osteochondritis dissecans, and exercise-induced collapse. In addition to X-rays certified by the OFA, your breeder should provide you with genetic testing and eye exam results for Collie eye anomaly. Dogs can be classified as affected, carriers, or clear of this genetic mutation. Responsible breeders will test their Border Collie breeding stock for this condition. Since your Shollie is a German Shepherd Border Collie cross, it can inherit genetic health issues from one or both parent breeds. The most common Shollie health issues for potential owners to be aware of include hip and elbow dysplasia, eye problems, epilepsy, bloat, pancreatic acinar atrophy, and osteochondritis dissecans. How can you ensure that the German Shepherd Collie mix puppies you are looking at are as healthy as possible? Here are some tips on finding healthy Shollie puppies. Because both parent breeds have some inherited health conditions that can be quite serious, it’s especially important for you to choose your Shollie breeder with care. This means that you should only work with reputable breeders who health test their Border Collie and German Shepherd breeding stock for genetic health problems. Avoid buying a Shollie puppy from a retail pet store or sight unseen from an ad on the Internet, especially if health information for the puppy’s parents is not made available to you. Choose a local, small-scale breeder who welcomes visits from potential buyers. Observe the living conditions of your puppy and meet the parents and litter mates. Most importantly, review the health records of your puppy and its parents to ensure that your Shollie puppy is healthy. The records should include the results of both genetic tests and physical veterinary exams. Look for a puppy that has been well socialized around people and other dogs. Your puppy should be lively and curious, and not overly shy or lethargic. The eyes, nose, and rear end should be clean and free of discharge. Many breeders will offer some sort of a health guarantee for their puppies. Sick puppies can be returned for a refund or replaced with another puppy. Be sure to read all paperwork carefully before you sign a contract. Is a Shollie the Right Dog for You? The Border Collie German Shepherd mix is a charming mixed breed dog that appeals to lots of dog lovers. But is the Shollie the right breed for you? As we’ve seen, the Shollie is a smart and energetic dog that does well in an active household with engaged owners who have plenty of time to spend interacting with their dog. Ideally, you should be able to provide your Shollie with plenty of outdoor space to run and play. The type of activity your Shollie gets is just as important as the amount. Remember that the Shollie inherits a combination of intelligence and a love of work from both parent breeds, so organized activities and task-oriented play are key to keeping your Collie Shepherd mix happy. Shollies are well suited to stimulating canine activities like agility, obedience, and herding trials, as well as flyball and Frisbee. Be prepared for regular grooming sessions, especially during seasonal shedding times, when daily brushing may be needed. This can be a good way to bond with your dog, as well as check for any lumps or bumps on the skin. Do you share your life with a Shollie already? We’d love to hear from you, so please tell us about your dog in the comments below! Border Collie. American Kennel Club. German Shepherd Dog. American Kennel Club. Tsai, K.L., Noorai, R.E., Starr-Moss, A.N., et al. Genome-Wide Association Studies for Multiple Diseases of the German Shepherd Dog. Mammalian Genome, 2011. Palanova, A. Collie Eye Anomaly: A Review. Veterinarni Medicina, 2015. Lenehan, T.M., Van Sickle, D.C. Canine Osteochondrosis. Textbook of Small Animal Orthopaedics, 1985.